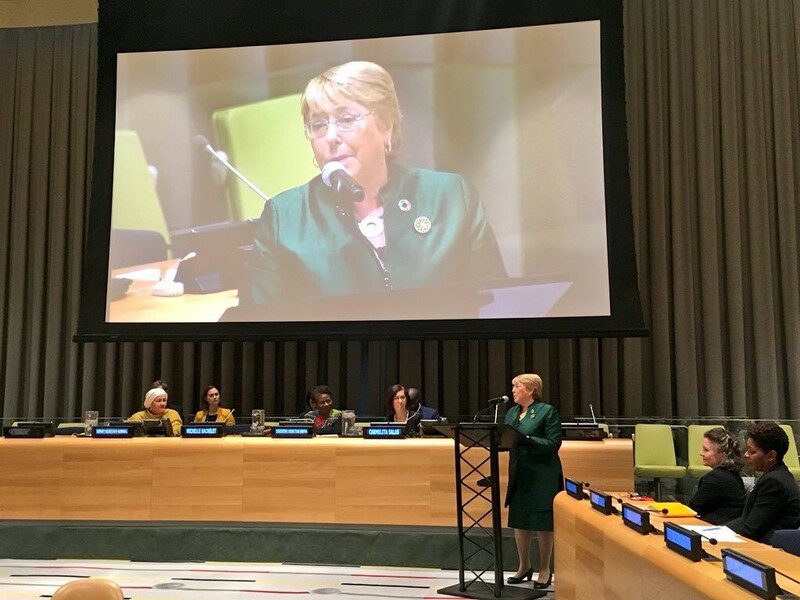 Former President of Chile Michelle Bachelet delivered the fourteenth lecture on 6 April of the Rafael M. Salas Memorial Lecture series, on the Every Woman Every Child Global Strategy for Women’s, Children’s and Adolescents’ Health (2016-2030). The lecture kicked off the countdown to the 25th Anniversary of the International Conference on Population and Development (ICPD) and the 50th Anniversary of when UNFPA began operations. The lecture series was created in 1989 to honour the memory of Rafael Salas, the first Executive Director of UNFPA. The aim of the series is to provide a unique forum for distinguished guest lecturers to discuss important aspects of population and development. As Co-Chair of the High-Level Steering Group for Every Woman Every Child, Ms. Bachelet launched Every Woman Every Child Latin America and the Caribbean, the first platform for tailored, regional implementation of the EWEC Global Strategy. A global champion for women and girls, Ms. Bachelet, gave particular focus in her lecture to the importance of investing in young women—especially those who are socially excluded—to achieve the ambition of the Sustainable Development Goals (SDGs) by 2030, noting that working together we can make a huge difference and transform our world for the better. In a complex development landscape, where women and girls remain particularly vulnerable to budget cuts, conflict and exploitation, the EWEC Global Strategy provides a roadmap for country-level implementation of the SDGs, through the lens of women’s, children’s and adolescents’ health and well-being. In her introductory remarks, UN Deputy Secretary-General Ms. Amina J. Mohammed recounted her role in the development and launch of the EWEC Global Strategy in 2015. She stated the three objectives of the EWEC Global Strategy—survive, thrive, transform—underpin the SDGs and are a profound expression of the Programme of Action of the International Conference on Population and Development. When leaders from around the world came together twenty-four years ago in Cairo, Egypt, they recognized population and development as a way to fulfil the sexual and reproductive health and reproductive rights of all people, and to ensure the centrality of health and rights to sustainable development. This Programme of Action is reflected in the 2030 Agenda for Sustainable Development, which highlights the intersection between better health and well-being and gender equality and women’s empowerment to achieve more prosperous, sustainable, inclusive and resilient societies. During the opening of the 51st session of the Commission on Population & Development (CPD) on 9 April, Ms. Mohammed, noted how the theme of this year’s session—“sustainable cities, human mobility and international migration”—speaks to our shared commitment to achieve the ambition of the Programme of Action and 2030 Agenda for Sustainable Development. In today’s world, people are moving at high rates within national borders, and international migration is growing more complex, with more countries serving simultaneously as countries of origin, transit and destination. Both urbanization and international migration are linked closely to the process of sustainable development. Cities are centers of social, economic and political activity that concentrate an increasing share of the world’s population and attract internal and international migrants alike.